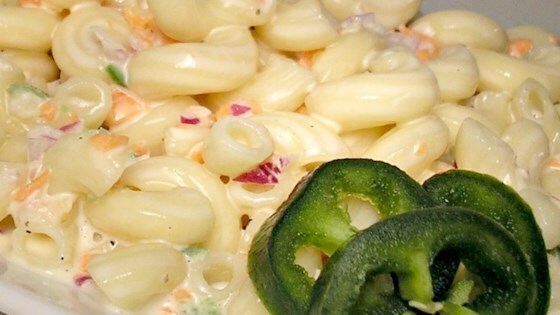 "This is a simple but tasty macaroni salad made with zesty white pepper, jalapeno, and green onions." Bring a large pot of lightly salted water to a boil. Add macaroni, and cook until tender, about 8 minutes. Drain, and rinse under cold running water. In a large bowl, mix together the mayonnaise, vinegar, sugar, salt, pepper, green onions and jalapeno peppers. Stir in the macaroni. Refrigerate until chilled before serving, at least 30 minutes. Deli-style made right at home! So very tasty. I added a tablespoon of sweet pickle relish. Either way it's a wonderful dish. We loved this!! Even made it with potatoes. And the surprise of the jalapenos, you never know just how hot it's going to be. And definitely double the recipe. The leftovers are just as good.